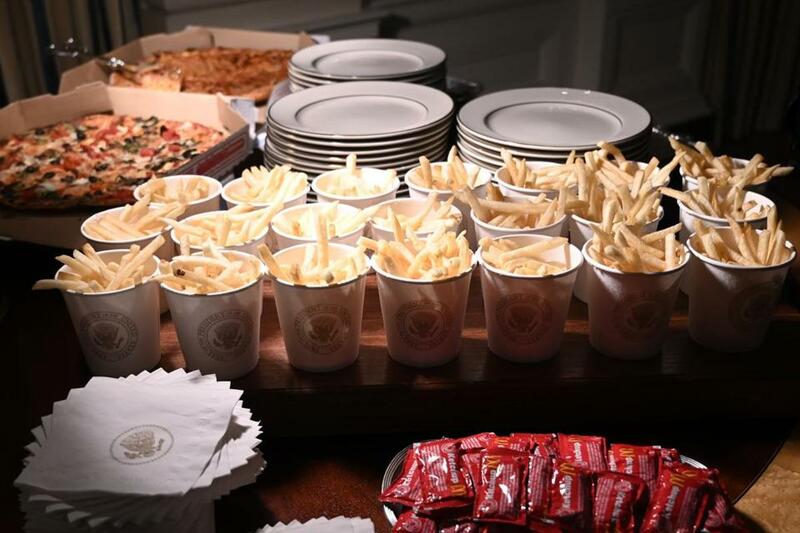 French fries and pizza were some of the fast food items for the reception for the Clemson Tigers in the State Dining Room of the White House Monday. The fast food feast that our caterer-in-chief procured for Clemson’s national championship football team was, to hear him tell it, a stunning act of generosity. With White House staff on furlough because of his shutdown, President Trump went into his own pocket to present the team with rapidly cooling junk food served on silver platters. How do we know that? Well, the president himself took to Twitter to misspell the word “hamburger” and announce, oh-so-magnanimously: “(I paid)”. Meanwhile, in the same city, someone else was preparing to feed the government workers whose hardship was at the root of the president’s greasy McStunt. 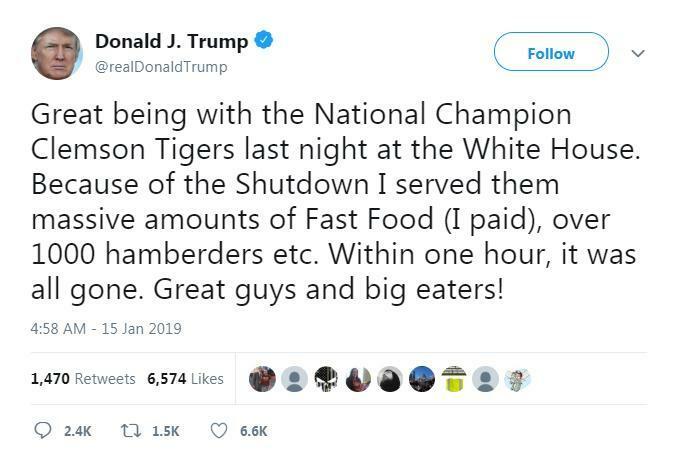 A capture of the now-deleted tweet, in which President Trump touts the ‘hamberders’ he bought for the Clemson Tigers football team. Calling the continued furlough of 800,000 federal workers an emergency, famed Washington D.C. chef José Andrés announced that his nonprofit relief effort World Central Kitchen would begin serving free meals in the city both he and Trump call home. It is not the first time that Andrés, whose restaurant Minibar in Washington, D.C., was awarded two coveted Michelin stars, has stepped in after Trump stepped in it. After Hurricane Maria devastated Andrés’ native Puerto Rico, World Central Kitchen and another effort he led, Chefs for Puerto Rico, stepped up and supplied 150,000 meals a day. A Maryland congressman confirmed that he nominated the chef for the Nobel Peace Prize. The spread at the White House — Big Macs, Wendy’s, things of that nature — would’ve been pretty condescending if we didn’t already know Trump loves fast food. Instead it was just the latest weird indignity, this time featuring the president of the United States beaming as he presented a table full of almost certainly cold Quarter Pounders and whatnot, a portrait of Abraham Lincoln grimacing behind him. If you thought he was bad at being president, get a load of his catering operation. The guy can’t even get a fast food order right. I am not a thin man, and I have known the pleasure of a Big Mac more times than I care to admit. But when I call fast food a “guilty pleasure,” I’m speaking of the nutritional content, labor and animal welfare practices that shake most of the industry, and not about the notion that fast food is inherently lower class. That Trump would host a White House banquet featuring fast food is not inherently embarrassing; done right, it actually could have been kind of cool (and how did the chief sticker-of-it-to-the-libs manage to throw this thing together without Chick-fil-A?). But any fast food aficionado — and Trump is famously one — knows that virtually the entire McDonald’s menu loses value faster than a new car leaving the lot. In a rational world you’d receive your Quarter Pounder with Cheese from the young man at the counter and shovel it immediately into your mouth; maybe he’d even tuck it in there for you. But wait even 10 minutes and the thing is starting to turn into a squishy, tepid mess — even worse if you’ve had to bring it out into the cold. Now imagine watching all this food congeal as someone carefully arranges sweet and sour sauce packets in a silver gravy boat and lights decadent candles. Not every fast food suffers from a half-life shorter than a Trump chief of staff. There’s a Popeyes less than a mile from 1600 Pennsylvania Avenue. I don’t imagine Andrés eats a lot of McDonald’s, but he’d never stand for this crime against food. Too bad he was busy on Monday. The Clemson football team — and the White House — deserved bedder.